Look deep into the nature; observe what it has to offer, peace, calm and a sense of wonder. Hear the serene voices of it. The quietness says a lot. Besides the lake, into the woods, make your next trip to Pawana lakeside with us. There is more luxury in nature than in any other place. What is more required to take your feet and wander once in a while into the midst of rustic climate and enjoy the privacy of your own and at times with your companion, family or friends? 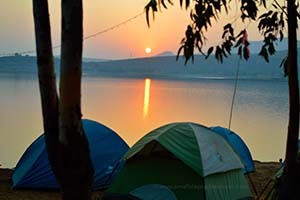 A fun-frolic overnight affair, Pawna Lake camping is not only about the pristine lake in Lonavala! The Pawana Lake spanning in front of you seems infinite; surrounded by mountains on all sides, forts like Tung, Tikona, Lohagad, and Visapur rise around it in 4 directions. A rising sun can be seen clearly as well the sunset. That fiery ball of fire while rising seems at peace with sky, gradually spreading its rays and turning that blue sky into saffron. While setting it presents a view of enclosing the rays within itself and spreading the grey- blackish carpet on the sky. Winter camping in pawna lake has to be a unique experience. The still water of the lake resembles the stillness of mind that we feel in midst of it. The forest that surrounds makes you feel that you are not in middle of trees but are part of them. Well with these feelings into mind, we at Small Steps Adventures offer various services beyond camping. 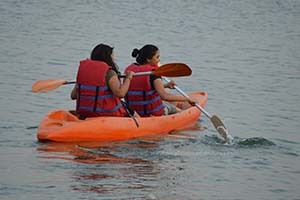 There are numerous water rides, like Kayaking, Speed boating, peddle boating and swimming in lake with safe life jackets. These activities enthuse and energize everyone. First filled with calm and peace with wonderful surrounding around you at night, bonfires and tents being hosted, the sunrise of the early morning and above mentioned activities satisfies your mind and soul. We here at Small Steps Adventures care about people venturing into these activities of camping and giving them a memorable experience that they will cherish for lifetime. The food and camping services are best that can be offered in the market. There are many overnight treks near Mumbai for weekend getaway but this winter Small Steps has brought camping events for the long weekend plans. So come join us and venture into Pawana Camping!